Ensifera tree modified from Gwynne (1995). Ensiferans are the "longhorned" orthopterans identified by their characteristic threadlike antennae which can reach to several times the body length. The group is largely nocturnal and many taxa are long-lived with adult life spans of over a year. Females inject eggs into plant material or soil through a long ovipositor (Chopard 1938, Beier 1972, Kevan 1989, Rentz 1996). Several taxa that have a reduced or absent ovipositor show maternal care of eggs or nymphs (Gwynne 1995). Ensiferans include most of the major groups of singing insects, taxa in which males stridulate to call mates. Stridulation involves rubbing together modified portions of the forewings in katydids (or bush-crickets (Tettigoniidae)) (Bailey and Rentz 1990), true crickets and their allies (Otte 1992, Desutter 1995) and Haglidae (Morris and Gwynne 1978) and a femur-abdominal mechanism in certain weta (Stenopelmatidae) (Field 1993). The more than 9000 described species in the suborder show a broad range of habits and habitats . They are found worldwide in diverse habitats. Some species retreat to crevices and burrows (Kevan 1989), an ancestral habit (Gwynne 1995) whereas others avoid natural enemies with a remarkable mimicry of leaves and other plant parts. 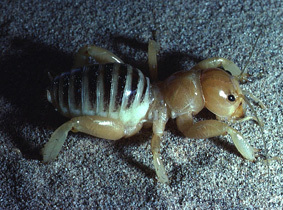 rolling crickets; and Rhaphidophoridae, the camel and cave crickets and cave weta. The remaining ensiferan taxa are splay-footed crickets (Schizodactylidae) of India and Africa, and the 3000 or so species of "true" crickets (including house, field, ground, tree and bush crickets) (Otte 1994). Zeuner (1939), Sharov (1968) and Gorochov (1995a,b) review the fossil history of Ensifera. The first fossils are from later Carboniferous. Sharov (1968) lists a number of extinct families and represents Ensifera as a paraphyletic taxon (showing the order Phasmatodea and suborder Caelifera as being derived from ancestral ensiferan stock) but places all extant families in one clade. Gorochov (1995a) recognizes two extinct ensiferan infraorders, Elcanidea and Oedischiidea, placing all extant (and some extinct) taxa in the infraorders Tettigoniidea and Gryllidea. Not included in the four groups are the extinct Phasmomimoidea and Vitimiidae, the relationships of which are unclear. The antennae are fine and threadlike (well over 30 segments) except in the completely fossorial Cooloolidae. In the singing families there are stridulatory specializations of the forewings which include a toothed vein (file) and scraper, and membranous areas that resonate or amplify sounds. In these groups ears consist of foretibial tympanae linked via modified tracheae to the enlarged mesothoracic spiracles that are modified for an auditory function. The tarsi have three to four segments. The six-valved ovipositor (when present) is sword-like ('ensiform', thus the subordinal name) or needle-like (Chopard 1920; Kevan 1982; Rentz 1991, 1996). Ensiferan mandibles are elongate and possess a prominent incisor. The gut's proventriculus consists of a globular body lying between two bulbous gastric caeca. Internally there are six longitudinal folds that bear appendages (Judd 1947; Rentz 1980). The spermatophore in virtually all species is attached externally to the female's gonopore; it has a double (or partially divided) sperm reservoir in most Tettigonioidea (some Rhaphidophoridae and Deinacrida species (Stenopelmatidae) are exceptions) and a single one in true crickets and their allies. In many taxa (most tettigonioids and some true crickets) a spermatophylax (meal for the female) surrounds the spermatophore (Boldyrev 1915; Gwynne 1995). Most authors divide ensiferan families into two to four higher taxa (infraorders (Kevan 1982, Gorochov 1995a) or superfamilies (Ander 1939, Zeuner 1939, Judd 1947, Key 1970, Ragge 1977, Rentz 1991)). The three superfamilies of Beier (1972), Key (1970) and Rentz (1991) (Tettigonioidea, Gryllacridoidea and Grylloidea) are shown as separate clades only in the trees of Zeuner (1939) and Ragge (1955). Here we follow Ander (1939), Judd (1949), Ragge (1977) and Gwynne (1995) and use a two-fold division of the Ensifera, recognizing the two distinct clades (see also Ragge 1977). Monophyly of terminal taxa. No formal analysis of characters has been done for any group except Desutter's (1987) treatment of neotropical taxa of true crickets and allies which shows these taxa to form a clade. The characters of the other most diverse taxon, Tettigoniidae, suggests that it is monophyletic (Hennig 1981), a conclusion supported by Gorochov's (1995b) tree. Gryllacridid and rhaphidophorid characters also suggest monophyly for these families (Rentz pers. comm. and Cohn, pers comm.). Gorochov (1995b) depicts the subgroups (both extinct and extant) of both the rhaphidophorids and haglids as forming separate clades. No author has suggested that the least diverse families, Cooloolidae (one genus) and Schizodactylidae (two genera) are not natural groups. Stenopelmatidae is, however, problematical. P. Johns (submitted) suggests that the Gonwanaland weta and related taxa (mainly antipodean) should be placed in a separate family (Anostostomatidae) from the Jerusalem crickets and allies (Stenopelmatidae). A similar scheme (but using Mimnermidae instead of Anostostomatidae) was suggested by Gorochov (1995b). There is no consensus on the evolutionary history of the relationships among families. The cladogram of extant groups suggested by Gwynne (1995) (see above) is a hypothesis based on a formal analysis of (morphological) characters. The single most parsimonious cladogram is identical to Ander's (1939) tree (a detailed and thorough review of ensiferan morphological characters) except for the position of Schizodactylidae, which Ander placed in the Tettigonioidea. In Gwynne (1995) this family is weakly placed as a sister group to true crickets and allies (less than 50% of bootstrap replications). The relationship of Schizodactylidae with other Ensifera has always been unclear (see Ander (1939)); schizodacylids have even been given equal taxonomic ranking to the other main Ensifera subgroups by some authors (e.g. Kevan 1982). Sharov's (1968) tree of extinct and extant Ensifera is often cited. His interpretation, based on the stridulatory organ and other wing characters, is unique in the closer relationship between the singing families Haglidae and the true crickets and allies rather than with the tettigoniids (see figure). Hennig (1981) and Kevan (1977) are critical of this tree and a more recent treatment of fossil and living ensiferans shows the more common conclusion for relationships among singing families i.e. a closer relationhip between Haglidae and Tettigoniidae (Gorochov 1995b). All other trees (Zeuner 1939; Ragge 1955; Gorochov 1995) show Tettigoniidae and Haglidae as sister taxa. These trees regard tegminal stridulation and tibial ears as homologous within Ensifera whereas the most parsimonious interpretation using Ander (1939) and Gwynne (1995) is a dual origin of these characters. Ander, K. 1939. Comparative anatomical and phylogenetic studies on the Ensifera (Saltatoria). Opusc. Entomol. Suppl. II. Lund. Bailey, W.J., and D.C.F. Rentz, eds. 1990. The Tettigoniidae: Biology, Systematics and Evolution. Bathurst, Australia: Crawford House. Beier, M. 1955. Ordnung: Saltatoptera. m. (Saltatoria Latreille 1817). Bronn's Kl. Ordn. Tierreichs (5) (3) 6:34-304. Beier, M. 1972. Ordnung Saltatoria (Grillen und Heuschrecken). Kükenthal's Handb. Zool. (Ed. 2) 4(2): 2-217. Boldyrev, B.T. 1915. Contributions a l'étude de la structure des spermatophores et des particularitès de la copulation chez Locustodea et Gryllodea. Horae Soc. Entomol. Rossicae 6:1-245. Chopard, L. 1920. Recherches sur la conformation et la développement des derniers segmentes abdominaux des Orthoptères. Thèse, Faculté des Sciences de Paris, Oberthur, Rennes. Chopard, L. 1938. La biologie des Orthoptères. Encycl. ent. Ser. A 20:iV:1-541. Chopard, L. 1949. Ordre des Orthoptères. Latreille 1793 - Olivier 1789; In Traité de Zoologie, ed. by P.-P. Grassé, Masson, Paris 9, Pp 617-722. Desutter, L. 1987. Structure et Ëvolution du complexe phallique des Gryllidea (Orthoptera) et classification des genres nèotropicaux de Grylloidea. Partie 1. Annls. Soc. ent. Fr. (N.S. ), 23: 213-239. Desutter-Grandcolas, L. 1995. Functional forewing morphology and stridulation in crickets (Orthoptera, Grylloidea). J. Zool., Lond. 236: 243-252. Field, L. H. 1993. Structure and evolution of stridulatory mechanisms in New Zealand wetas (Orthoptera: Stenopelmatidae). Int. J. Insect Morphol. & Embryol. 22:163-183. Gibbs, G. 1994. The demon grasshoppers. New Zealand Geographic No. 21: 90-117. Gorochov, A. V. 1995a. Contribution to the system and evolution of the order Orthoptera. Zoologichesky Zhurnal 74:39-45. (in russian). Gorochov, A.V. 1995b. System amd Evolution of the Suborder Ensifera. Proc. Zool. Inst. Russian Acad. Sci. Vol. 260. (in russian). Gwynne, D. T. 1995. Phylogeny of the Ensifera (Orthoptera): a hypothesis supporting multiple origins of acoustical signalling, complex spermatophores and maternal care in crickets, katydids, and weta. J. Orth. Res. 4:203-218. Hennig, W. 1981. Insect Phylogeny. Chichester: John Wiley and Sons. Judd, W.W. 1947. A comparative study of the proventriculus of orthopteroid insects with reference to its use in taxonomy. Can. J. Res. 26:93-159. Kevan, D.K.McE. 1977. The higher classification of the orthopteroid insects: a general view. Mem. Lyman ent. Mueum Res. Lab. 4:1-31. Kevan, D.K. McE. 1982. 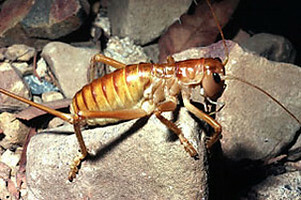 Orthoptera. In Synopsis and Classification of Living Organisms, ed. S. P. Parker. New York: McGraw Hill, pp. 352-383. Kevan, D.K.McE. 1989. Grigs that dig and grasshoppers that grovel. Rev. Ecol. Biol. Sol. 26:267-289. Key, K.H.L. 1970. Orthoptera. In Insects of Australia, ed. CSIRO. Melbourne: Melbourne University Press. Morris, G.K., and D.T. Gwynne. 1978. Geographical distribution and biological observations of Cyphoderris (Orthoptera: Haglidae) with a description of a new species. Psyche 85:147-167. Otte, D. 1992. Evolution of cricket songs. J. Orth. Res. 1:25-47. Otte, D. 1994. Orthoptera Species File. 1. Crickets (Grylloidea). The Orthopterist's Society and The Academy of Natural Sciences, Philadelphia, 120 pp. Otte, D. 1997. Orthoptera Species File. 7. Tettigonioidea. Philadelphia: Academy of Natural Sciences. Ragge, D.R. 1955. The Wing-Venation of the Orthoptera Saltatoria. London: British Museum of Natural History. Ragge, D.R. 1977. Classification of the Tettigonioidea. In The Higher Classification of the Orthopteroid Insects, ed. D.K McE Kevan, Lyman Ent. Mus. Res. Lab. Special. Pub. No. 10, pp. 44-49. Rentz, D.C.F. 1980. A new family of ensiferous Orthoptera from the coastal sands of southeast Queensland. Mem. Queensland Museum 20:49-63. Rentz, D.C.F. 1991. Orthoptera. In Insects of Australia, ed. CSIRO. Melbourne: Melbourne University Press. Rentz, D.C.F. 1996. Grasshopper Country: The Abundant Orthopteroid Insects of Australia. University of New South Wales Press. Sharov, A.G. 1968. Phylogeny of the Orthopteroidea. Trans. Paleontol. Instit. Acad. Sci. 118:1-216. Zeuner, F.E. 1939. Fossil Orthoptera Ensifera. London: British Museum Natural History. The Orthoptera Species File Online (a taxonomic database of the world's orthopteroid insects). Tettigonioidea. University of Florida Natural Area & Teaching Lab: crickets & katydids. Keys and species lists of North American crickets and katydids. Thanks to Pat Lorch and David Rentz for comments.